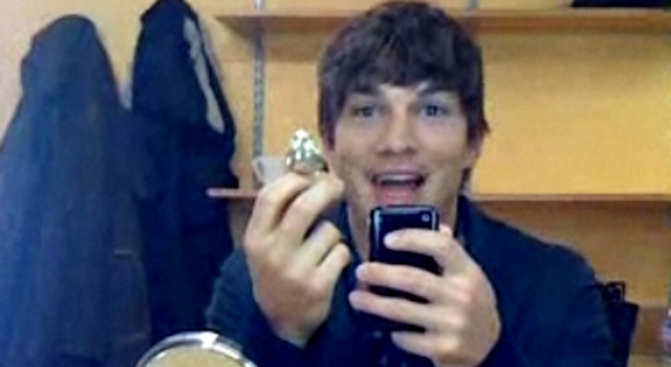 Ashton Kutcher celebrates an earlier Twitter award. The actor triumphed over CNN in their much ballyhooed race to be the first to reach a million followers on the microblogging Web site. Kutcher surpassed that benchmark in the early morning hours Friday, narrowly edging out the Time Warner Inc.-owned network. The actor had long trailed CNN, but he staged a rally in recent days that captured the attention of the Web. He apparently had some help along the way from Twitter. On Friday, some Twitter users complained that they weren't allowed to unfollow Kutcher's Twitter account. The action had been disabled. "Twitter locked peeps from unfollowing @aplusk (Kutcher's account) for Oprah today," @myvegasscene tweeted. The actor was scheduled to appear on Oprah Winfrey's show on Friday to celebrate his victory. For her part the talk show queen joined the San Francisco-based social networking site on Friday as well. A move that was teased by Twitter CEO Evan Williams tweeted "tomorrow just became a very big day (more later)." After his come-from-behind win, Kutcher celebrated by tweeting "Victory is ours!" and webcasting a video live on ustream.tv. He declared his initial Twitter war on CNN using Bay Area-based Qik, which allows users to stream video live from their cell phone. At the same time, Oprah Winfrey made her entry to Twitter, joining the site and holding a Twitter special on her show Friday with Kutcher as a guest. She gained 100,000 followers in less than a day. Kutcher, CNN and Winfrey pledged to mark the occasion by purchasing mosquito bed nets to combat malaria. Kutcher donated $100,000 to the Malaria No More Fund, the charity said Friday. Though celebrities have become commonplace on Twitter -- where people "follow" each other's updates of 140-characters or less -- Winfrey's entry was sure to cause ripples. The talk show host was welcomed onto the site with messages from George Stephanopoulos, Ellen DeGeneres, Jimmy Fallon and Shaquille O'Neal.